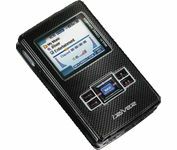 The sleek and compact H320 digital music player holds up to 600 hours of your favorite songs. Plus, you can transfer and store digital pictures and view them on the vivid color display. A rechargeable battery that lasts up to 16 hours, enhanced 3D sound, ultra-fast USB 2.0 file transfers and simple navigation are just a few of the features you won t find anywhere else.